Here is what my garden looks like right now. Just about everything is covered with a material called row cover (also called Remay). My tomato cages are covered from top to bottom with it. 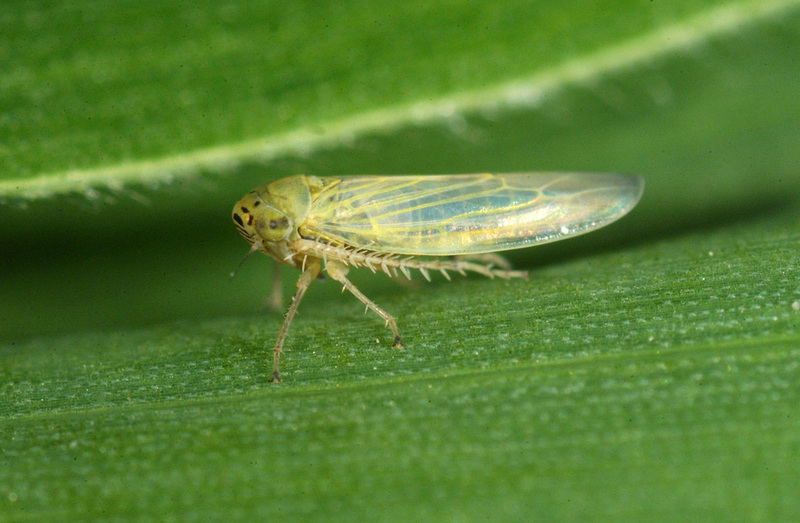 This acts as a physical barrier to keep a bug called the beet leafhopper from biting them and transferring a disease called Curly Top Virus (CTV). I’ll take it off my tomatoes when the monsoons arrive. The bug leaves when the monsoons come. 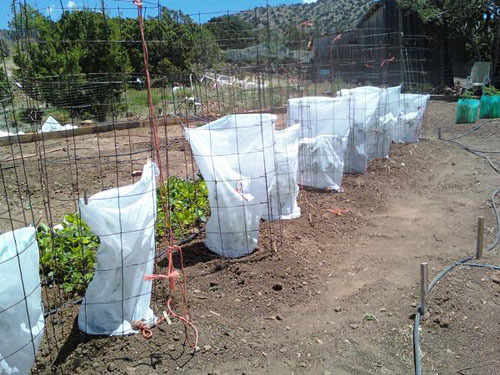 I also put row cover over my other veggie transplants while they adjust to the heat and wind when I transplant them into the garden. And I put it over other veggies that I plant by seeds like beans, cucumber and corn. I just plant the seeds in the ground and put a sheet of row cover over them tacking it down with rocks so the wind doesn’t blow it away-but don’t make it too tight. Give the plants some room to grow under it. When the seeds germinate, row cover keeps the birds from eating the sprouts and I don’t have to replant seeds as often. Plus you can water right through it. Row cover comes in 3 weights. A heavy weight (1.0) for fall-winter, a mid-weight for summer (.5) and a light weight (.3) which does not work well here because of the winds-it rips easily. I use a mid-weight in the summer in my garden. So basically I use row cover in the beginning of the growing season on almost everything. You can get it at most nurseries. And you won’t have to keep it on all summer. Once your corn and beans grow up about 4 inches, and your transplants adjust to outdoor growing and the bugs leave, you can take it off and enjoy watching your garden grow. 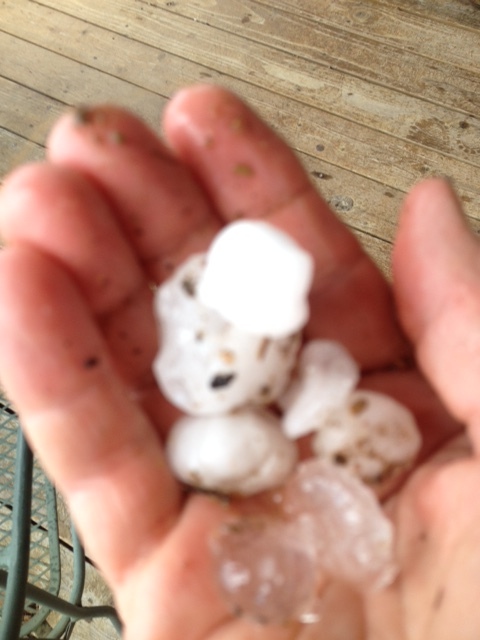 Another plus is it gives some protection against hail. Great stuff. I highly recommend it to be a more successful gardener. So disappointing. 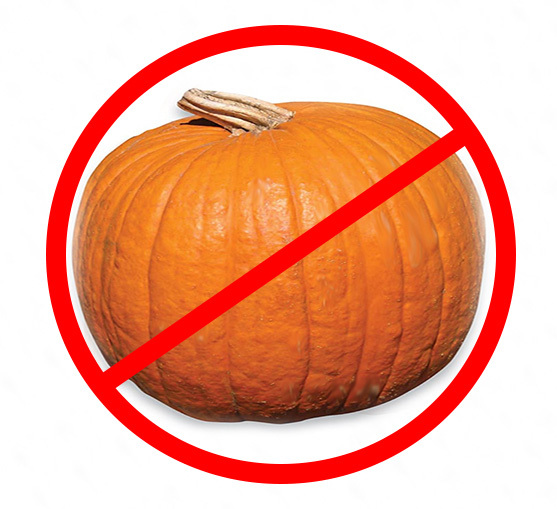 No giant pumpkin this year-not even a little one. I started with 3 plants. 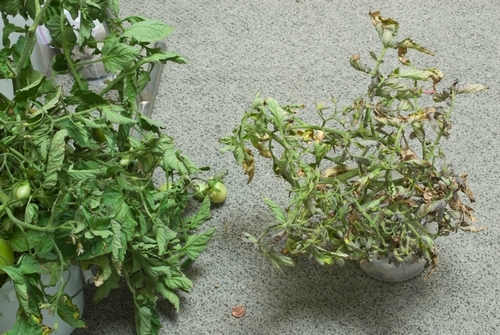 Two died of a wilt. I checked to make sure they didn’t have a squash vine borer in them-which they didn’t. I pulled both by the end of July. 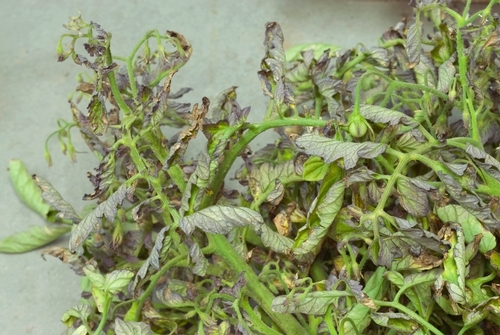 I just pulled my third and last giant pumpkin plant and sent it to the State Lab last week to see if they could diagnosis what disease it had. The leaves were weird – they were stiff and broke easily, the stems were weird with galls and the blossoms wouldn’t open or stayed small and dropped off—all of them. I didn’t even have one to pollinate. This is the first time since I started growing giant pumpkins that I’ve had this kind of trouble. Some years I’ve grown great pumpkins, some years not so great but I’ve always had at least one giant pumpkin. Not this year – nada and no annual pumpkin bash! What a bummer.